Clever, lyrical and beautiful, Tim Minchin's beat poem Storm has been viewed millions of times on YouTube, and it's finally been turned into a book. So how does it fare? Pretty well. Okay, that's an understatement. It's fares brilliantly. Minchin's poem about two dinner guests (Michin and the eponymous Storm) in a verbal battle over science and belief is lifted seamlessly from the screen to the page. It all hinges on Minchin's poem itself, which is rhythmical and flows beautifully. 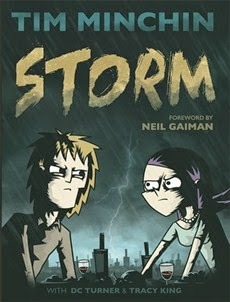 The video of Storm, of course, has Minchin reading aloud, but reading the poem yourself the lyricism is still there. And that moment when Storm is first said works brilliantly - I could hear the thunder crackling and imagine ominous music playing as I read those first few pages and got to that opening. And then it's backed up by absolutely gorgeous artwork. Storm on the page is slightly darker than Storm on the screen, but it's no less appealing for that. Each panel holds motion within it even though it's a still image, and the words flowing over the top create a movement from picture to picture. Storm doesn't just recycle material from the short film. Granted, there are obviously images reused, but this book has been put together like a completely separate project, and there are many, many new drawings, while scenes from the video have been rejigged to make them work on the page. Every panel on the page is the kind that makes you go back again and again, and each time notice something slightly different - a particular shade of a particular colour, a particular image, the way a font is used. My edition of Storm comes with pieces by Minchin, Turner and King talking about Storm, as well as an introduction by the amazing Neil Gaiman, who says everything about Storm I wish I could say, and says it much better. And since he's done that, there's not much for me to add, apart from that you should read the graphic novel of Storm, and watch the film (below) and fall in love with them both.